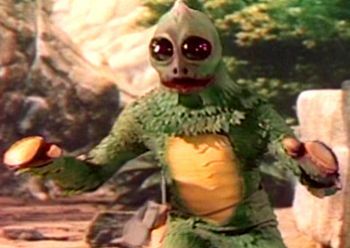 Seeking a way home, the Porters encounter evil lizard-people known as Sleestak. In this episode, we are introduced to the LOTL90 version of the Sleestak. Other than being reptilian and having left remnants of a previous civilization, they do not have much in common with the Sleestak of LOTL70. We see only the same three Sleestak characters throughout the two seasons of the series. 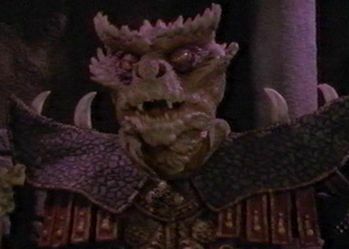 It is explained by Shung that he and his two lackeys, Nim and Keeg, are criminals exiled from the Sleestak civilization which now resides entirely underground having been forced to abandon the surface by their own pollution. One of Shung's lackeys is named Keeg, "geek" spelled backwards. Keeg appears to have a droopy eyelid on his right side. At 0:23 in the episode, as Keeg bends over to dig for the iguana, the actor's bare back is visible as the costume shirt rides up his torso! At 2:40 in the episode, Stink jumps out of a tree onto the roof of the Porter's Jeep! At 2:47 in the episode, when Christa exchanges greetings with Tom, she calls him Porter. Perhaps this is a small homage to the LOTL70 theme song which famously refers to Rick Marshall as simply Marshall. After explaining to Christa and Stink that he and his kids are going on a scouting expedition in the Jeep to look for a way out of the Land, Tom invites them to meet at the tree-house at sundown for dinner, adding "I think we'll have something to celebrate." If he means he thinks they will have found a way out, wouldn't he just lead his kids through it while they had the chance and not return for supper first? Like the Marshalls in LOTL70, the Porters appear to be making maps of their explored territory. 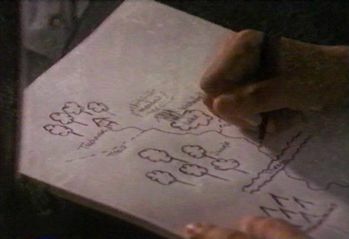 Annie is shown in this and other episodes as the artistic one in the family and appears to be responsible for drawing the maps. 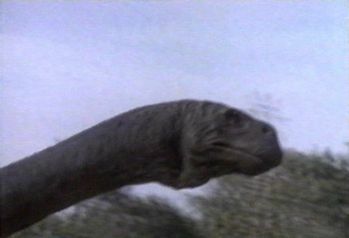 The local brontosaur is first referred to as Big Guy in this episode, a name he retains for the rest of the series. 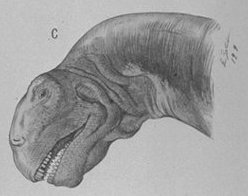 Although referred to as a brontosaur on the packaging of LOTL90 licensed products, the head of the creature presented in the show appears to distinguish it as a Camarasaurus instead (note the placement of the nostrils and hanging fold of skin where head meets neck). This episode implies that our three Sleestak criminals may be responsible for the lack of Pakuni in the area. From Shung's statements they apparently used to eat them! From 15:53-15:56, as Shung absently waves around the activated flashlight taken from the Jeep, Nim appears to be following the spotlight with his head like a cat watching a flashlight or laser-pointer beam on the wall! Christa comments that long ago the Sleestak caught many Pakuni, including Stink's mother and father, and worked them to death. This episode is the first time we hear Stink say "malu" (bad or evil). As the series progresses we find that it is one of Stink's favorite words and is used frequently. In "Jungle Girl", Tom questioned how it was that Christa was able to speak English (she came from Earth with her family as a child and remembers some of it). Why does he not question the Sleestak's ability to speak it here? There's no reason they should know the language. My closest No-Prize answer is that they are not actually speaking English; it is demonstrated in this episode that Shung has at least some telepathic ability (he senses the humans presence) so perhaps the humans are "hearing" telepathic emanations from him and the other two Sleestaks which are telepathically translated between English and Sleestak. In the following episode, "The Crystal", Shung appears to have somewhat of a mental connection with the crystal dagger he carries, so it may also augment telepathic abilities in those nearby. At 18:27 in the episode, Christa shines a flashlight into Keeg's face, causing him to flinch back and shield his eyes, suggesting these Sleestak have some (though lesser) weakness to bright light like their previous incarnation on LOTL70. 2:45 Tom and Christa exchange the term "acuba ne". "Acuba ne" is a Pakuni term used for both "greetings" and "farewell"; in this case, "Greetings." 17:10 Stink says, "Sleestaks malu, malu! Miyogi!" "Sleestaks bad, bad! Stay away!" If the Sleestak civilization had to move underground due to having polluted the surface, where is that pollution now? The world as we see it in the course of the series does not appear to be polluted and the humans and the three Sleestak criminals seem to be living in the Land just fine. Why doesn't the Sleestak civilization move back up?